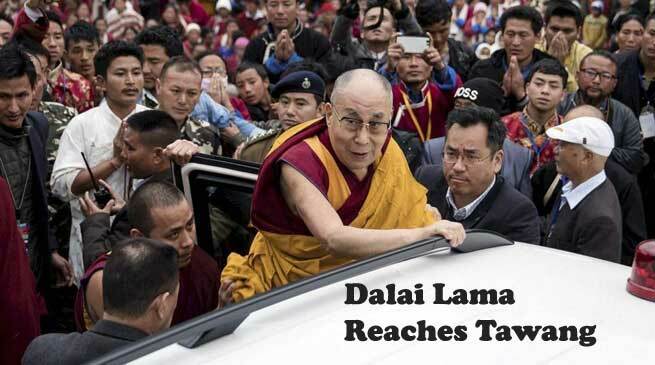 Tibetan spiritual leader the Dalai Lama reached Tawang on Friday. Arunachal Pradesh Chief Minister Pema Khandu accompanied the Dalai Lama. It must be mentioned here that Tawang is , Tawang is home to Monpa people who follow Tibetan Buddhism. Tawang town at a height of 10,000 feet was decorated with colourful prayer flags, Indian and Tibetan flags as well as flowers. The roads were repainted and the drains cleared. Thousands of people from neighbouring Bhutan holding traditional ceremonial scarves and burning incense queued up on both sides of the road for a glimpse of the Dalai Lama. The Tawang monastery belongs to the Gelugpa school of Mahayana Buddhism and had a religious connection with Lhasa’s Drepung monastery that continued during the British rule. This will be the Dalai Lama’s visit to Arunachal after eight years. His first visit to the state was in 1983 and the last trip was in 2009.